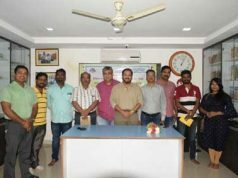 Bhubaneswar: Kalinga Diaries conducted their fifth and maiden tour to Daya river Valley from Jatani side on Sunday 6th May, with an almost fresh list of locations keeping with their motto of promoting unknown and lesser known heritage sites of Odisha. As usual, the tour started from Jayadeba Vihar at 6:30 AM. The first destination was Somnatha at Budhapada, 15 kms from Bhubaneswar. Somnatha at Budhapada is one of the most beautiful temple of great Kalingan Architecture. The shrine, most popularly known as Chudakhia Somnatha temple is said to be built by the artisans and craftsmen, who were the workforce behind the making of great Konarka temple. “The beauty of this temple is just out of thinking. The adjacent pond, with trees and natural scenery are just wonderful”, said Mr. Sambit Nayak, a software professional. The next site was Gopinatha temple in rustic Kakudia village. The famous Gopinatha temple is one of rare monument of Vaishnava cult. 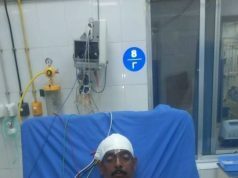 The temple is said to be built by Ganga rulers. “The carvings of this temple is so beautiful, I am surprised how at that time those craftsman built such things is just out of imagine” , said Mr. Nadir Pasha, a native of South Africa, who is on his visit to India. Then, the visitors moved towards Paschima Sambhu temple, located near the melana ground at Harirajpur. Although the temple is fully renovated but the stories and local folklores associated with the temple and the local people’s faith in it are quite strong. The temple is also associated with the Chudakhia Somnatha, as both are said to be brothers according to local legends. The group then went to a quiet and lesser village Rathipur in which another Gopinatha temple by the name Saakhi Gopinatha is situated. Although the temple is currently under renovation, still its architecture is quite unique and is one of the lesser known monument in the entire area. 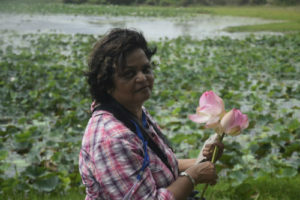 Tourists also enjoyed plucking mangoes from the roadside trees there and visited a scenic lotus pond nearby. The last stoppage was village Panchagaan, where they visited the 18th century Lord Jagannath temple. The carvings inside the Jagannath temple are very beautiful especially the wooden carvings engraved on the vimanas of Lord. A rare statue of Goddess Asta Durga as Mahisasurmadini is also present in the compound though in dilapidated condition. Just a few distance ahead a temple dedicated to Jain Tirthankaras is also there aongwith a rock cut tank. This tour had a mix of 14 heritage enthusiast from South Africa, West Bengal and of course local tourists of Bhubaneswar. 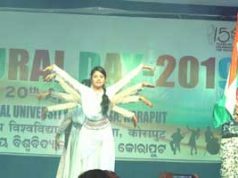 Lets know that just like Prachi Valley, Daya Valley also played a very important role in shaping the history of erstwhile Kalinga. The valley, has not been explored to the fullest which contains some of the fantastic monuments related to all sects. “Kalinga Diaries was started by three heritage enthusiasts in their attempt to highlight the lesser known monuments of Odisha. 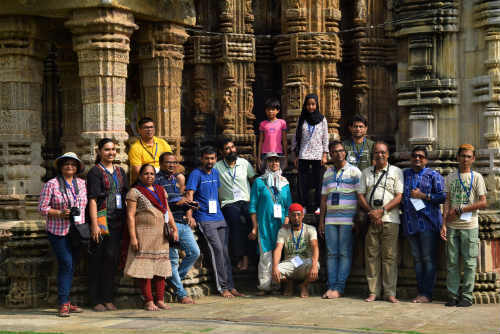 We will conduct our next tour in the month of June with some new sets of heritage monuments including some new scenic spots”, a representative of Kalinga Diaries said.